Bill saying that the Lensbaby darkens makes me feel not so lame. In this case it might be good, I usually blow out light in the woods like this, the creek is barely visible though. Love this, Chloe in the sunshine is perfect! I do like how Chloe stands out in the image. Cool shot. The lensbaby really enhanced this shot and its moodiness! An air of discovery on the part of the dog…Great photo! The lighting is perfect in this image! The lighting is dramatic and heightens the determined action of the dog as she makes her way though the woods. Chloe is one lucky dog…she gets to go everywhere!! Dark is good for those damp woodsy shots, I think. I tend towards underexposure in all my shots and I s’pose with the Lensbaby more than ever. I’m going to try to lighten up this year! I really love this shot. Chloe seems a perfect subject for the blur. By the way, does she ever look directly at the camera? I always seem to see her with that downward glance. I have the Lensbaby Muse and am going to try and use it more this year on the challenge. I like using the cutouts too with it. I like all of your Lensbaby shots. I think the lensbaby works here. Having the focus and the light on Cloe makes the image very interesting. Very interesting effects that you achieve using the Lensbaby. I really like the focus on Chloe against the blurred background. maybe there are two sunshines: The pretty dog and the light falling onto him. Nice Ellen! What aperture ring were you using? I’m guessing probably an f2?? The blur around Chloe is perfect. 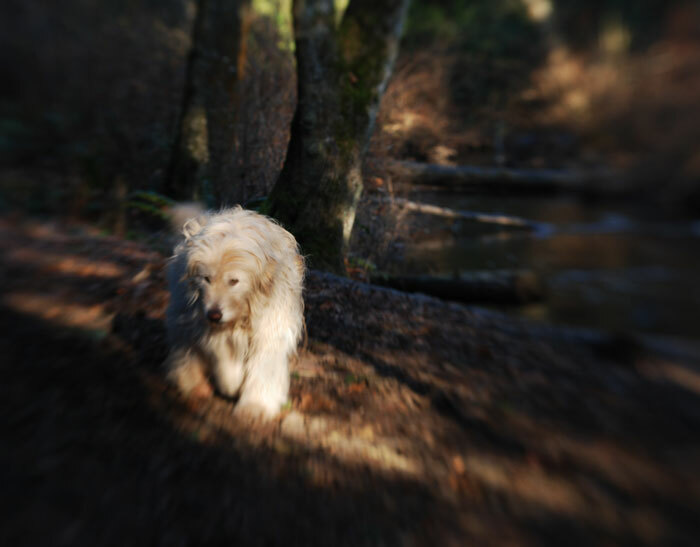 One of my favorite lensbaby shots yet….LOVE this! If this was taken today we got gypped up here, for it was doom and gloom from above! Always love to see Chloe. Makes me feel like I’ve had a few glasses of wine, but I love the focus on the dog. Whoa – this one gave me a little Lensbaby stomach…whirly! Nice focus on Chloe, though!